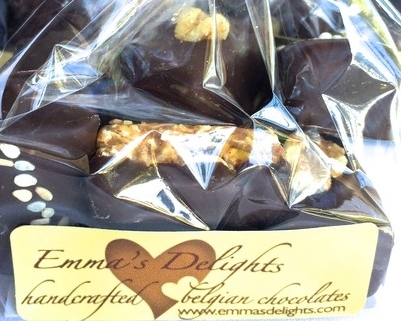 If you have any questions about your order or Emma's Delights, feel free to contact us or call us at 408.857.2389. Amandine: Amandine: refers to the almond paste filling: amande (French)/amandel (Flemish). It is also a woman's name. 'Almond cream' refresh to the smooth combo of almond paste and dark chocolate. It is absolutely DAIRY FREE! We have many more flavors available by special order and specialize in creating new flavors, based on our customers' predilections, party theme, and wine selections. Please contact us to create your own or place a request on our Events page! We use Callebaut Belgian chocolate for our couverture AND all our fillings that are made with chocolate, e.g., ganaches and our nut 'creams' (dairy free!). Callebaut Belgian chocolate is arguably one of the finest chocolates in the world because of the very strict guidelines they use to make their chocolate from cacao bean to couverture: from sourcing the beans, fermentation and drying, to blending different varieties of beans, roasting and extremely finely grinding the beans (with sugar) into cocoa mass, which is then ready for the 'conching' process (careful kneading of chocolate dough for hours at high temperature). Careful conching is critical to get rid of any undesired acidic flavors and to blend all the remaining flavors together. That is why some high percentage chocolates taste extremely acidic which some people confuse with a 'typical' dark chocolate taste while it is just the result of a very bad conching process. Finally, the chocolate is finished with pure cocoa butter and natural vanilla for a balanced taste. Callebaut only uses 100% pure cocoa butter and a dash of natural Bourbon vanilla. 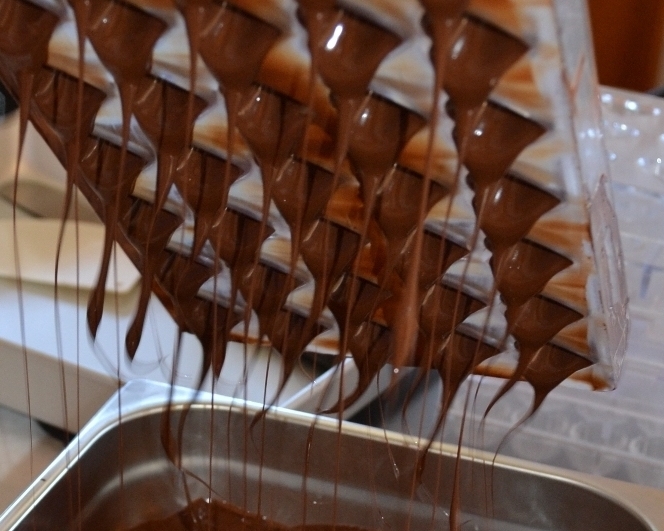 What is so typical about Belgian chocolates? And what is the California flair for innovation about? The typical Belgian chocolates or 'pralines' as we call them are made with molds because one of the characteristics of Belgian chocolates is the fresh cream as base of a lot of fillings, which are very fluid, and you cannot use the dipping or enrobing method for that. Our California flair for innovation comes in where we do use the classic molding technique but fill most of them with, let's say, a 'healthier' filling like nut creams that are completely dairy free and often also sugar free, unless we use a praliné paste (a caramelized nut paste). Dark chocolate should never contain any dairy products. If you buy dark chocolate that lists milk powder or butter as an ingredient STAY AWAY from it. If your dark chocolate lists sugar as the first ingredient RUN from it. This is BELOW dark chocolate standards. The first ingredient of dark chocolate should ALWAYS be chocolate liquor or cocoa mass (used interchangeably). Sugar can be the second or third ingredient before or after cacao butter, depending on cacao percentage. Lower quality products often replace the more expensive cacao butter, the natural by-product of conching with regular butter or vegetable oils to produce a cheaper product that is of a far lesser quality. Those chocolates will also lack the 'snap' as you bite in them, one of the 5 'Ss' that are so characteristic of well tempered chocolate (snap, shine, smoothness, shrink, streak-free). Most of our ganaches are nut free, except those with a praliné paste; other nut free options include our chocolate dipped fruit and the chocolate dipped power seeds bar pieces. We offer free shipping for orders over $50.00 to CA, NV, OR, WA. All other orders are shipped for a $6.50 flat fee. All shipping is regular ground shipping by USPS. Next-day or overnight shipping is available and will be billed to the customer.